For many, this election season may have presented itself with stressful and obsessive episodes of feelings and actions not easily explainable. Particularly for those who already struggle with anxiety and depression, the heightened media forays and triggering candidate remarks may have brought on a resurgence in symptoms. 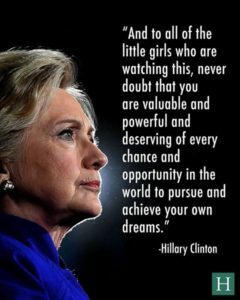 As a woman and as a person who has focused their career on protecting human rights and fighting for social justice issues this election cycle has greatly upset me. As someone suffering from depression and anxiety, the past 24 hours have been extremely hard on my mental health. If you’re anything like me you’re sitting here confused, betrayed, sleep deprived, angry, hurt, and extremely anxious about the future. This election just feels like the culmination and cementing of so much negativity, so much divisiveness, so much hate, it can be easy to feel like just giving up. Don’t. So, first things first, we all need to de-stress after this election. If we are going to have constructive next steps, we need to clear our heads first. I know that the the temptation is to roll up in ball under a blanket and pretend it’s not happening, but that will just make it worse in the long run. And there are so many things you can do to cope with the stress and disappointment of this election — things that will maybe make today feel just a little more OK.
Stay close to the ones you love: Make plans to hang out with friends or family. Use a Mantra: Sometimes just a few inspiring words can help ground you. Mantras can be so useful when coping with stress that seems extreme. Whether your mantra focuses on hope, acceptance, or another positive feeling, don’t underestimate the power of words that we tell ourselves. Take a step back and get outside: Don’t take the facebook bait. You are allowed to walk away from all forms of media. The shouting matches and voter returns play-by-plays may be too much for you to handle. If so, give yourself permission to unplug. You are allowed to sit in quiet and not discuss your personal viewpoint. Everything that comes up doesn’t have to come out. You are allowed to maintain your sanity in any way you see fit. Walk away from the pundits, naysayers, and opinionated bigots. Take care of yourself: You might not be on your best form today and that’s just fine. 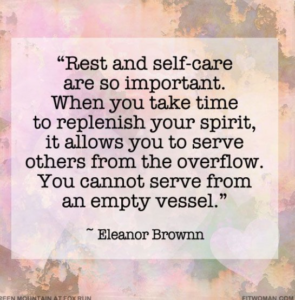 Don’t forget to take care of yourself. you can’t pour from an empty cup. Go easy on yourself if you are feeling sluggish in your work day or underperforming this week. Take a break, take a breath, and refocus.Don’t expect to be performing 100 percent and don’t be shy about cutting yourself a break. Get your sleep: Self-care means not skimping on the basics, like sleep. Without it, everything in the world can feel SO MUCH WORSE. Make sure you’re indulging in your six, or eight, or ten(!) hours a night — whatever you need to feel refreshed and relaxed during the day. Need some help sleeping? Check out these tips. Don’t catastrophize: Rather than imagining negative scenarios, try to stay in the immediacy of the present moment. Bring all your attention to a couple of complete breaths or to the soles of your feet where they connect with the ground to help you stay centered. There’s no point in imagining the worst case scenario when it might never come to be. Focus on what you’re grateful for: The election season coincides with the holidays and can be a tremendously difficult time for everyone… Relationships are what what lead to a happy and fulfilled life. Now more than ever we all need to cultivate happy personal and business relationships. Gratitude can also help mitigate depression. Taking the time to speak with people you love about what you are grateful for will help tremendously. I hope that we can be kind to everyone during this difficult transition. Taking a moment to be grateful for the people and good things you have in your life can make all the difference. Stick to your routine: This can help to give them control and provide a distraction over something they cannot.” It may not feel like a real day today, but sticking to the things that work for you. Create a ritual that calls to you: For some, that might mean unwinding at the end of a long day in a calming bath. For others, it might be enjoying a soothing cup of tea and conversation with someone you love. Whatever it is, incorporate it into your daily or weekly life to honor its importance to you. Breathe: “Even just five minutes of mindful breathing can calm your nervous system and reduce stress,” Jamie Price, Wellness Expert & Co-Founder of Stop, Breathe & Think meditation app, tells Bustle. “It also helps to name your emotions, which can have the effect of diminishing their force and intensity.” Meditation has been known to reduce stress, anxiety, and depression. If you haven’t tried it yet, here are some easy beginner guided meditations to try. Download one of these 10 apps to help reduce your stress. Listen to ASMR: ASMR stands for autonomous sensory meridian response. It doesn’t work for everybody, but some people report that these videos induce a calming, relaxing sensation. Feel Your feelings. You don’t have to be positive today. You don’t even have to be positive tomorrow. This healing is going to take time, and you don’t need to rush it. You need to experience it.” Sometimes you just need to get it off your chest. If you let yourself have a mini-meltdown, you’ll feel purged and better afterward. Read here the personal examples of how some women of color are practicing self-care after the election. If you want to read the full articles from where this list was compiled click here and here.